In this year’s Robofest game at Lawrence Tech, students must program their autonomous robots to remove the white boxes (shown in the attached photo), retrieve the black box and measure the area of the black triangle in square millimeters. The teams must use math skills such as algebra, geometry and trigonometry to accomplish these tasks. This year Robofest has attracted more than 1,600 students on 550 teams from eight states – Michigan, Ohio, Texas, Minnesota, Florida, Hawaii, California and Louisiana – and five other countries – Canada, Mexico, Korea, China and India. “To compete in the World Championship is not easy. 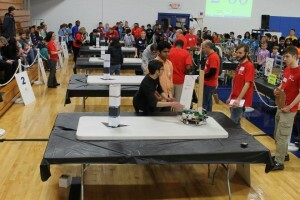 These teams had to qualify at one of the many regional competitions,” said LTU Computer Science Professor CJ Chung, who started Robofest in 2000. This year’s game is SRCC, which stands for search, rescue, clean up and collect data. The mission is to search for and rescue people trapped in a black box from a tower, clean up white toxic boxes from the contaminated area, and measure the size of the contaminated area in square millimeters. This challenge reinforces STEM learning. Robofest is different from most other robotics competitions because all of the game’s robotic tasks require teams to use math skills such as algebra, geometry and trigonometry. Winners in the Robofest World Championship will be awarded scholarships to LTU as well as various prizes donated by sponsors. In addition to the game, there will be a science fair-style exhibition competition, which will demonstrate the imagination and creativity of the students through robotics. An advanced competition category, VCRC (Vision Centric Robot Challenge) has attracted five college teams from the US, China, and Brazil and three local high school teams. Vision-based autonomous robot vehicles must maneuver through an obstacle course. This challenge enables students to learn core technologies for self-driving cars.